Not Rock - Paper - Scissors but, Scrap - And - Wrap. Designs in scrapbooking and wire wrapping. Creating original PEI Scrapbooking memorabilia to enhance your albums and photos. 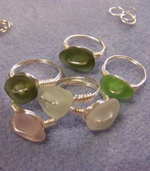 Fashioning Seaglass into Wire Wrapped Jewellery to wear or give as a gift.